I was surprised when everything seemed to “just work” when I made the jump to 64-bit R 2.11.1 a while back. “Surprised” because my previous attempt to join the 64-bit world under 2.10.x was a dead-end: the must-have RMySQL package didn’t like the 32-bit MySQL drivers, but Leopard’s 32-bit perl couldn’t deal with 64-bit drivers, etc., etc. Too much hassle for my new non-IT self to deal with. So today I found the first thing which didn’t “just work” in the jump: the rggobi package. The July and August meetings of the New England R Users group focused on two different aspects of R performance: parallel processing techniques and the effects of compiler & library selection when compiling the R executable itself. It was during Amy Szczepanski’s excellent introduction to multicore, Rmpi, and foreach (slides here) that she mentioned that the nice people who compile R for the Mac use optimized libraries to improve its performance. Amy works at the University of Tennessee’s Center for Remote Data Analysis and Visualization where they build and run machines with tens of thousands of cores, so her endorsement carries a lot of weight. I think Amy mentioned that she had benchmarked the open source vs. Revolutions distributions on her Mac, but I can’t find it in her slides and, well, in one ear and out the other…. It was the comprehensive presentation by IBM’s Vipin Sachdeva (slides here) showing 15-20X speedups through compiler and library selection that made me want to try a couple of benchmarks myself. And my recent it’s-about-time upgrade to 2.11 seemed like the perfect opportunity. 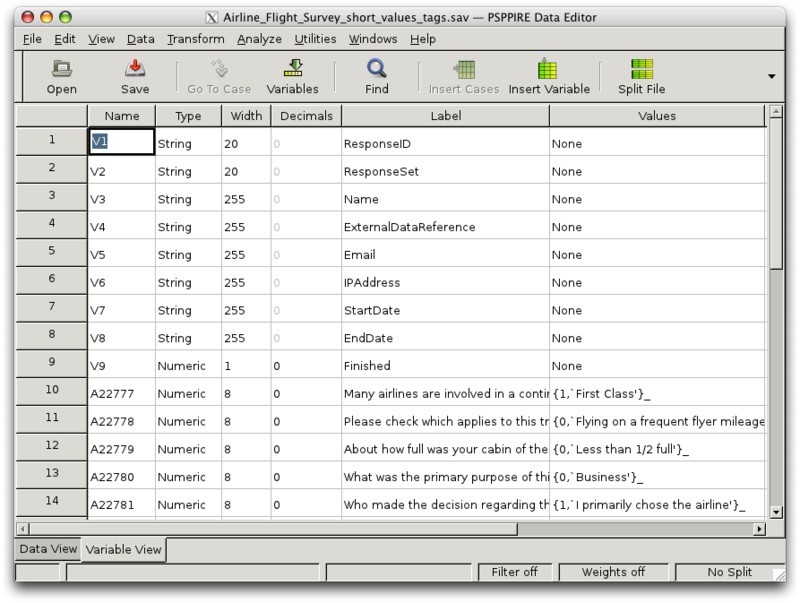 Performance is one of the advantages claimed by Revolution Analytics for its distributions, with their product page promising “optimized libraries and compiler techniques run most computation-intensive programs significantly faster than Base R” even with their free, Community edition. I have heard good things about its performance on Windows, so I was curious to see if it provides an improvement over the already-optimized Mac binary. First, some disclaimers: I am not a serious benchmarker and have made no special effort for statistical rigor. I am just looking for order-of-magnitudes here, so I kept a normal number of programs running in the background, like Firefox and OpenOffice, though nothing was doing anything substantial and I avoided any user input while each test ran. My machine is the short-lived, late-2008, aluminum unibody 13″ MacBook (MacBook5,1) with 4GB RAM and Mac OS X Leopard 10.5.8 running the 32-bit kernel. It has a 2.4GHz Core 2 Duo — nothing special. For my tests, I ran the standard R Benchmark 2.5 available from AT&T ‘s benchmarking page which performs various matrix and vector calculations — perfect for discerning the effects of such optimized libraries. I kept the defaults, such as running each test 3 times, and installed the required “SuppDists” package. I tested the open source 2.10.1 32-bit version I already had on my machine and then installed Revolution’s 2.10.1-based 64-bit community edition. I should have repeated the test with the open source 64-bit edition, but I didn’t think of it at the time (I told you I wasn’t serious about this), so instead I later re-ran the benchmark with the 32- and 64-bit versions of the open source 2.11.1 to check if there are any significant 32-vs-64 differences. 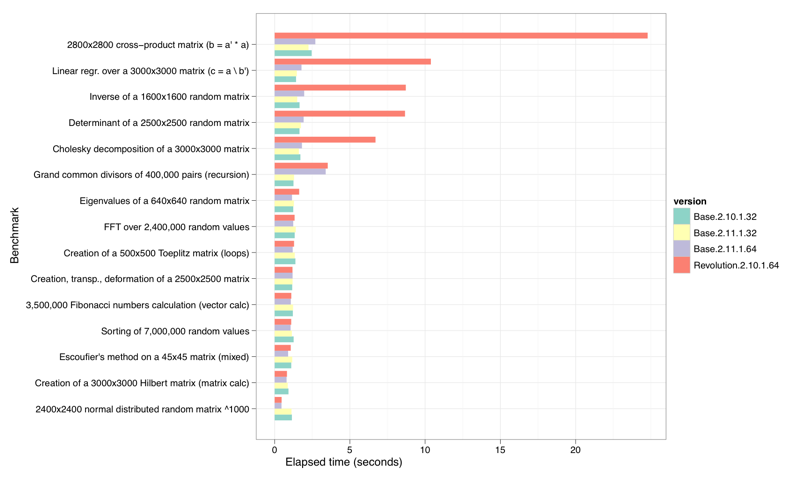 Figure 1 shows the geometric means of the elapsed times for each benchmark section as reported by R Benchmark 2.5. Clearly the Revolutions distribution did significantly worse on the matrix benchmarks. 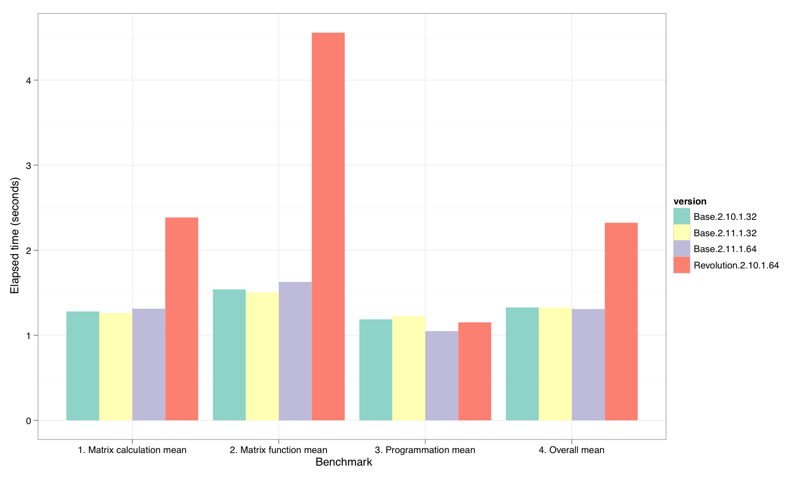 Figure 2 drills into the individual benchmarks to show the roughly 2-8X difference on the five slowest matrix benchmarks. Only on the sixth, Grand common divisors of 400,000 pairs (recursion), was the slowdown matched by the base 64-bit distribution. Only on Revolution’s fastest benchmark,2400×2400 normal distributed random matrix ^1000 all the way at the bottom of Figure 2, did the 64-bit versions hold a distinct (and roughly equal) advantage over their 32-bit brethren. As Vipin had demonstrated, using a fast BLAS and LAPACK libraries can make all the difference in the world (well, 20X or so). And since Apple controls the horizontal and vertical on their platform, it shouldn’t be a surprise that vecLib is fast on their hardware and OS. The real question is why doesn’t Revolutions simply link to vecLib too? It can’t be because their libraries are better (they clearly aren’t). Nor could they be afraid of competing with their Enterprise edition because, according to this edition comparison chart, they don’t offer an enterprise edition for the Mac. Perhaps they’re simply not that familiar with the platform and don’t know about vecLib. I know I didn’t know anything about it until these tests prompted me to consult The Google. So there still seems to be plenty of opportunity to beat vecLib if you’re willing to compile R and mix and match BLAS libraries. For the rest of us, the open source distribution offers the best bang for the buck. Maybe I need to ask Vipin to take a look at my Mac at the next meeting…. REvolution Computing packages Copyright (C) 2010 REvolution Computing, Inc.